Nikon quietly announced the DSA-N1 and DSB-N1 adapters that couple Nikon 1 cameras with Nikon's fieldscopes. 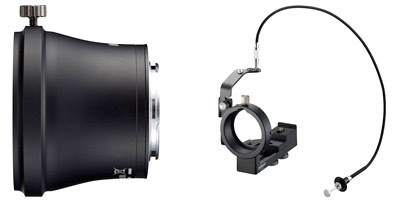 The DSA-N1 adapter is a true adapter, coupling the fieldscope's eyepiece to the Nikon 1 lens mount. The DSB-N1 adapter holds the Nikon 1 camera (with one of three lenses: 10-30mm, 11-27.5mm, or 18.5mm) at the appropriate distance from the exit pupil of the fieldscope. The DSB-N1 adapter also includes a Rube Goldbergish cable release (remember, the Nikon 1 cameras all feature perfectly workable wireless remote releases). Curiously, the announcement specifically mentions only the V1, J1, and J2 cameras. 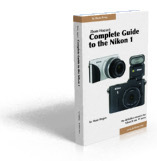 I suspect that the divisions within Nikon aren't talking to each other ;~). My guess is that once the V2 is shipping, the Sport Optics division will get around to validating the V2, too. Both adapters work with a wide variety of recent Nikon fieldscopes and eyepieces. How much magnification you get depends upon which eyepiece you use, but you can get combinations that put you at as little as 1° angle of view. In fact, if I'm calculating right, you get can combinations that get you up to about the equivalent of a 3700mm lens, though normally you'd probably use combinations that end up in the 1000-2000mm equivalent range (the viewfinder and EXIF data will always report f/6.3 and 540mm). To calculate actual focal length: EyepieceMagnification x AdapterFocalLength x 2.7 = EquivalentFocalLength. So, for instance, using a 30x eyepiece on the DSA-N1 gives you an equivalent focal length of 1458mm. To calculate aperture: EyepieceMagnification x AdapterFocalLength / FieldscopeDiameter. So for the 85 series with a DSA-N1 and 30x, this would be f/6.4. Nikon has one fieldscope, the EDG 85 VR, which as the name implies, has vibration reduction (power with AA batteries in the fieldscope itself). But generally digiscoping means a good quality tripod, as you'll be working at small effective apertures (in Aperture priority or Manual exposure mode on a Nikon 1) and very high magnification. Digiscoping is what a lot of dedicated birders like to use to capture their life lists in photos, so having a one-company solution like Nikon is now supplying should make things easier for those new to the game.